The cloister of Westminster Abbey has several monuments to the colonial services. Here's one of them. The words are by George Cunningham, who had a long career in India's North West Frontier Province. Some years before the plaque was unveiled, a companion inscription appeared at the base of the Jaipur Column in Delhi. 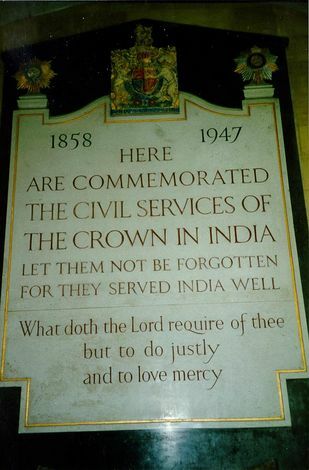 That one read: "In Thought Faith, In Word Wisdom, In Deed Courage, In Life Service, So may India be great."